A Buddha statue has been built on the premises of a Hindu temple in a Mullaitivu village, despite years of fierce opposition by locals. 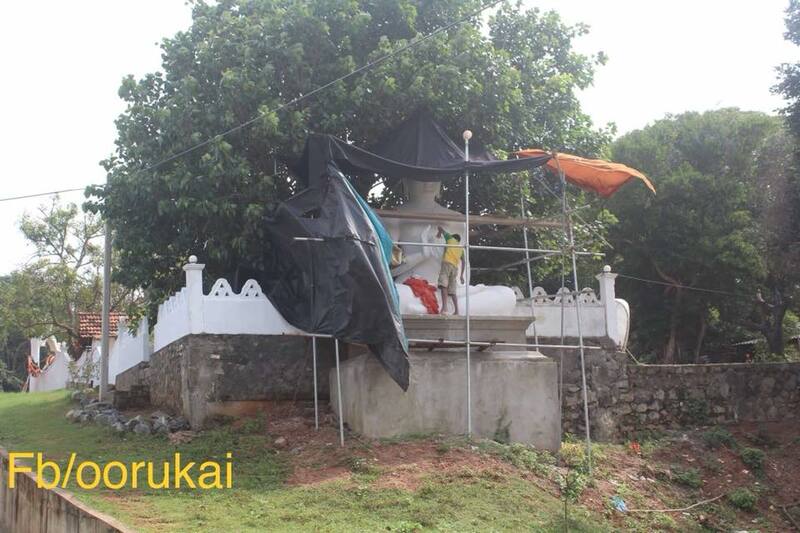 Residents of Neeraviyadi in the Semmalai area of Mullaitivu said a Sinhala Buddhist monk had used the opportunity of Sri Lanka’s political crisis, while local authorities were distracted, to push through the construction of a large Buddha statue directly encroaching the village’s Pillaiyaar Kovil. A gazette notification soon followed, declaring the land as archaeological premises, allowing the monk to begin setting up a Buddhist vihara, ignoring the fierce opposition of locals campaigning to preserve the Hindu temple. However since 2015 intensified local protests prevented further construction or expansion of the Buddhist infrastructure. The latest developments where a large Buddha statue and walls had been constructed quickly and suddenly have angered Semmalai residents, who have thus far been blocked from rehabilitating their own temple due to military occupation. Locals also pointed out that there were no Buddhist residents in the area for a vihara to serve. A Tamil language sign indicating the Hindu temple had also been destroyed and replaced with a Sinhala sign.